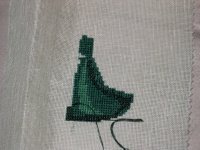 I have been a bad girl about stitching this week. Allen was sick earlier in the week and while he was waiting for his prescription to be filled he picked up a copy of Civilization 4. Needless to say, once I played a little I got a bit hooked. I am almost done with the game I started so I think I should be back on the path of good soon. Tonight I finished up part 4 of Mystery 9 and then saw that Martina put up part 5 a little bit early. Unfortunately, our printer won’t turn on for some strange reason. Hopefully when Allen comes back from his party he can get it to work. I am not sure if I will start part 4 this weekend. 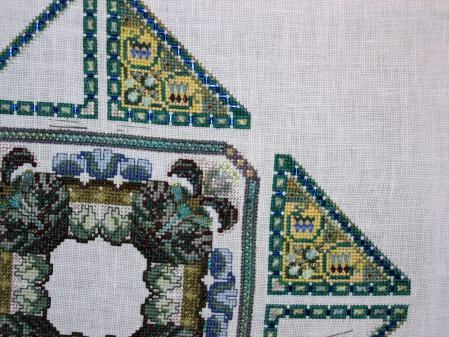 I hadn’t planned on getting part 5 until Monday, so I was thinking about putting in some good stitching on White Wedding and/or Celtic Winter. We shall see. 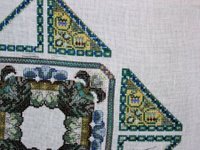 Tomorrow, I think I will head to Falls Church to a needlework shop to see if they have the GAST that I need for the round robin I will be starting soon. Allen even said he would go with me:) Then we will probably go to lunch in Tyson’s Corner. And then my progress on my most recent ornament, Free as the Wind. The green blob is the main part of her dress. Hope you got the email with the A and N freebies OK. Let me know if you still want the border as well. Mystery IX is looking very nice – have a good weekend. Here we go… part 5 already from Martina!